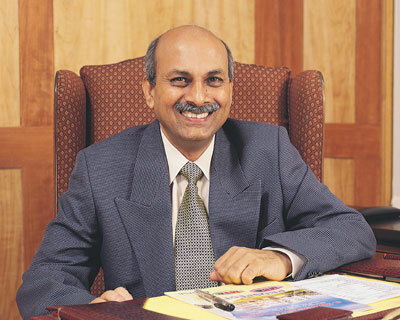 DR. PRABHAKAR BASAPRABHU KORE, Chairman, K.L.E. Society & Chancellor, KLE University, Belgaum, a legendary figure in the domain of education, health care, co-operative endeavour and community building. A second time MP in the Rajya Sabha, Dr. P. B. Kore is well known in the political and social circles for his significant contributions and commitment to the transformation of society through education and healthcare. He has been at the helm of Karnataka Lingayat Education Society (KLES) as Chairman since 1984 & the last three decades have seen KLE grow from 38 institutions in 1984 into a massive organization of 240 institutions of international repute in education and health care. Today KLE is engaged in the delivery of quality education to about 1,00,000 learners - ranging from Pre-primary to post-doctoral level - virtually in every sphere of human knowledge, facilitated by a dedicated team of 16,000 qualified and experienced KLE employees. The KLE educational services spectrum today encompasses institutions of School Education in Kannada, Marathi and English medium, and centres of higher education and research in the faculties of Arts, Science, Commerce, Education, Medical, Dental, Pharmacy, Nursing, Physiotherapy, Ayurveda, Hospital Administration, Engineering, Law, Management, Agriculture, Fashion Technology, Tourism, Hotel Management & Catering. The Society during this phase has distinguished itself by taking much needed advanced health care services to the doorstep of the people in this part of the country. Positioned at its pinnacle in terms of its reach and performance, the organization has emerged as one of the largest education and healthcare providers in India with 240 institutions catering to the needs of the community. His visionary efforts to facilitate higher education with an all-inclusive community centric approach and a global perspective has seen KLE forge collaborations in the field of Health Sciences through MoUs with Universities of Illinois, Chicago, and Sunderland (UK). Dr. Kore has also been instrumental in the commencement of two Community Radio stations, one each at Hubli and Belgaum. These help provide a voice to the concerns of society and serve as valuable means of transforming society through participatory education. Under his guidance a sophisticated 2500 bed KLE Hospital and Medical Research Centre with a 1200 bed charitable wing, has been set up at Belgaum. In reverence and recognition of his relentless efforts vision and selfless contribution the K.L.E.Society named this great monument of national pride as KLES Prabhakar Kore Hospital and M.R.C., Belgaum. Dr. Kore is an example of exemplary leadership and his humble, democratic and progressive way management has enabled KLE evolve into a truly Global Organization. 'Suvarna Karnataka Rajyotsav Award – 2006' for outstanding contribution in the field of education by the Govt. of Karnataka. 'Outstanding Educationist' of the year 2004 by 'Giants International Group'. This prestigious award was presented by Sri Amitabh Bachhan, the icon of the Indian Film Industry. Life Time Achievement Award for Education, Service and Commitment to Society awarded by Veershaiva Samaj of North America in New York. Rotary International Award for his outstanding contribution in the field of Education and Health Services. Aravind Award by Nadoj Pratisthan, Belgaum. Actively involved in the Karnataka Ranga Bhoomi and Natak Academy. Honoured on 21st December, 2007 by the Kannada Sangh Bahrain, the Island of Pearls in Persian Gulf, in "Kannada Vaibhav 2007" at the hands of Shri Balakrishna Shetty Indian Ambassador to Bahrain. 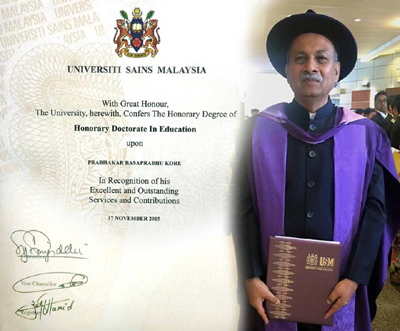 Conferred Honorary Doctorate by Karnatak University, Dharwad in recognition of his outstanding contribution to the field of education. He has been working ceaselessly to raise the standard of living of the downtrodden through welfare and educational measure. General Council of School Planning & Architecture.